Here's why you need to learn how to throw a four seam fastball correctly. You and your infielders have gotten you in a tight situation. A walk and a couple of kicked groundballs later leave the bases loaded with two outs. The count is 2 and 2 and you are walking behind the mound wondering what to throw now. You trust your catcher to block a ball in the dirt, so you decide on the sinker, your two seam fastball. The catcher agrees with you and calls for the sinker. You are hoping the batter chases the pitch and swings and misses. But, no, he didn’t bite. That’s ok; there is no panic in you. You trust your four seam fastball. It’s been your “go to” pitch since you first started pitching. Here’s the wind up, the pitch and strike three is called. You hit the outside corner, like you have been doing the whole season and the batter froze. No swing and the inning is over. You certainly showed you know how to throw a four seam fastball. The four seam fastball is a pitcher’s bread and butter pitch. It is the pitch you can throw the hardest and with the best control. Depending on where you are at with your other pitches, the four seam fastball is going to be the pitch you throw seventy percent of the time. How to throw a four seam fastball is the first thing you should learn after mastering the pitching windup mechanics. While the four seam fastball may not have a lot of movement, it’s the pitch you want to learn to hit the corners with. Since it doesn’t move much, it is easier to control. A hard fastball on the low inside corner is just as hard to hit as a curveball. Learn to hit your spots and you are more than half way to becoming a good pitcher. 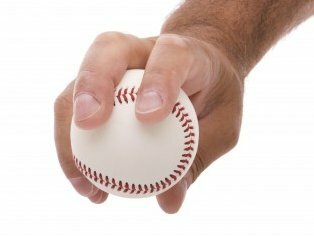 Step one in “How to throw a four seam fastball” is the pitching grip. Find the horseshoe or “C” part of the baseball. This is where the seams of the baseball are the farthest apart. Place your index (first finger) and middle finger over the seam, with about one third of the fingers lying over the top of the seam. If your hand is still growing and is not very big yet, then go ahead and use three fingers. Now as the baseball rests in your hand, each finger is lying over the seams twice. This is how the pitch gets the name four seam. The thumb should be placed underneath the baseball, in the area where there is no seam. It should line up directly in the middle of the index and middle fingers. Step two in “How to throw a four seam fastball” is the release of the pitch. When you are throwing this pitch, the baseball should not be touching the palm of your hand. And you want to grip it gently, which will create the least amount of friction when you throw the baseball. Less friction creates more backspin which creates more velocity. The final step in “How to throw a four seam fastball” is throwing the pitch. You want all the pressure from your pitching hand going thru the index and middle fingers. This applies all of your force to the middle of the baseball, which translates into more backspin and greater velocity. This is called staying behind the baseball. It means pushing the ball all the way thru the release point. That is all the steps on how to throw a four seam fastball except one. And this next step is the biggest step of all. Practice, practice and more practice. Since this is your go to pitch, your bread and butter pitch, you better learn to hit your spots. Pitch location is the most important part of pitching. In the scenario I described at the beginning of this article, I said the pitcher threw his sinker on the 2 and 2 count because he trusted his catcher to block a ball in the dirt. But the other big reason he knew he could throw a breaking pitch on a two and two count was because he knew he could throw his four seam fastball for a strike on a 3 and 2 count. Not only did he know he could throw his four seam fastball for a strike, but that he could hit a spot. He knew he would throw a pitch that would be hard to hit. That is what practice, practice and more practice is for. Learn to hit your spots and you to will have pitching confidence.